An attractive centerpiece for your kitchen or dining room table, the Amish Eco Friendly Lazy Susan Basket is ready to help host delicious family dinners and gatherings. Add your favorite spices, condiments and napkins to this handcrafted basket to keep everything within reach. 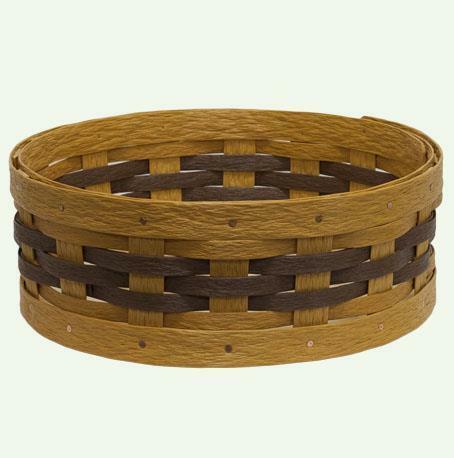 Supply yourself with two Eco Friendly Lazy Susan Baskets, one for inside and one outdoors on your picnic table. This beautiful basket not only offers a helping hand, it contributes to a green household with its eco friendly nature. This basket is made entirely of recycled plastics that save milk jugs and detergent bottles from flooding our landfills. They are gathered, re-purposed and handwoven to create useful and decorative household baskets. Browse more of our Indiana Baskets Collection to find more treasures for your home. This eco friendly plastic material works both inside and out, so be sure to grab the baskets you need for your patio or pool as well. You've found the perfect gift for a friend or family member who runs a green household. Choose from a variety of fun colors from brights to neutrals for these eco friendly baskets. 13 1/2" Diameter x 5"
Handmade from 100% Post-Consumer Product!